COLUMBIA - Faculty and staff from Moberly Area Community College and Stephens College announced a program to streamline the transfer process. 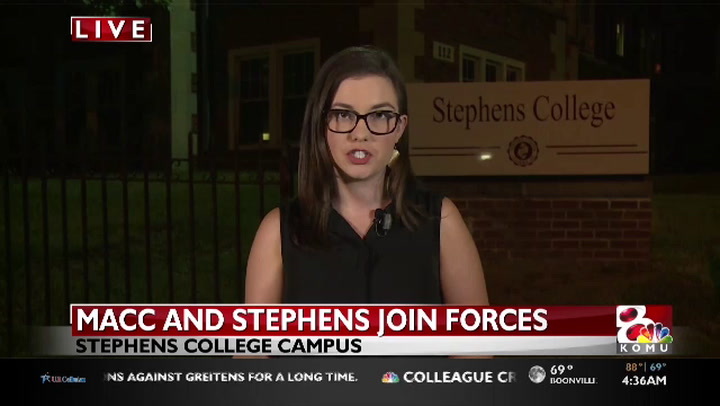 MACC told KOMU 8 in a written statement, "Transfer is a critical part of MACC's mission and the MACCStephens element of this partnership will help facilitate transfer and completion of students who desire the Stephens experience." Dr. Brian Sajko, creator of the MACCStephens Agreement, said the point of the program is to make the on-campus college experience more accessible. “We know the value of a women’s education and so really we want to make that more available to more people,” he said. Students transferring to Stephens College will have a specific graduation plan designed for them with a three or four-year graduation timeline. Sajko said the plan is targeted toward students who weren’t able to enter a four-year higher education institution immediately following high school. MACC students can enjoy the same benefits as a Stephens College student while paying the MACC tuition. These include study abroad trips, admittance to honors programs and student ID card privileges like access to on-campus performances. Sajko said the program was founded upon being a good neighbor and enhancing the Columbia education community. He said the two schools’ presidents already had a well-established relationship. “Dr. Lashley and Dr. Lynch are very close to each other, so this kind of just brings everything closer together,” Sajko said. He said money coming from both institutions will better fund student activities. He also said professors from MACC are invited to research and collaborate with Stephens College staff. The program was first developed eight months ago. A formal signing of the agreement will take place Tuesday at 1:30 p.m.